Embroidering on paper is an easy-to-learn technique that is used for adding accents to gift tags, cards, bookmarks, gift bags and for using in scrapbooking projects. It is best to work with heavy paper or cardstock, but you can use other materials as well. Almost any hand embroidery pattern or design can be stitched on plain or colored paper using basic embroidery stitches. 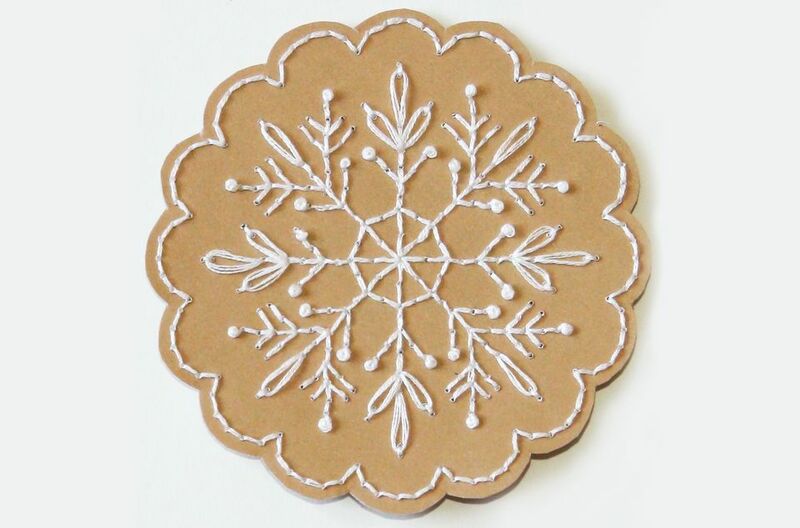 This tutorial uses a pattern from the Gingerbread Dreams Pattern Set, enlarged slightly to make a 4-inch motif which would make an excellent ornament or gift tag. There are four different motifs in the pattern that are perfect as a first-time paper embroidery project. After gathering your supplies, enlarge the embroidery pattern to the desired size and trace the design onto the wrong side of the paper using the pencil. Not all papers are thin enough to trace through, so in those times transfer paper will also work. Because some papers have a rough and a smooth side, be sure to note which side will be the right side. In this sample, the design is traced onto the rough side of the paper. A light touch is best when marking the design, so the markings can easily be removed later by gently erasing. Place the marked piece of paper over the cork or packing foam scrap, with the marked side facing you. Using the embroidery needle, pierce the paper at all intersecting lines, and at regular intervals, pressing the tip of the needle through the paper and into the cork below. Pre-piercing the stitching lines helps prevent any accidental creasing in the paper while working the designs, and the use of the underlayment protects your work surface from any damage the needle might inflict. Be careful not to make the holes too close together or they may tear through the paper as you stitch, which would distort your design. Turn the paper over and embroider the design. Do not use knots - start and end your thread like you would for any type of embroidery project worked on fabric, weaving the ends. Rather than using an away knot, you can temporarily hold the end in place with a small tab of removable tape. Basic stitches work best when embroidering on paper. This sample uses back stitch, detached chain stitch and French knots to work the design. After working the embroidery, carefully erase the marked lines from the back side of the piece if they show through to the front. Your embroidered paper motif is now ready to use. Working with a pattern is a great place to start, but once you've gotten comfortable with the process of stitching on paper, there is so much more you can do. Try embroidering a border of stitches along the edge of a notecard or improvising some flowers!